Paul Pogba saw red as Manchester United’s fine recent run came to an abrupt end after Paris Saint-Germain earned a stunning 2-0 win at Old Trafford on Tuesday in the first leg of their Champions League last-16 tie. 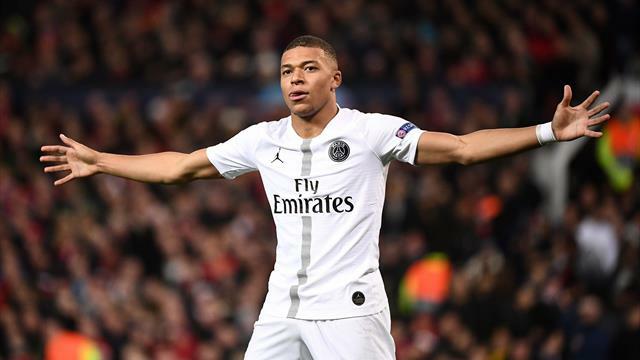 Second-half away goals from Presnel Kimpembe and the brilliant Kylian Mbappe put the French visitors firmly in control of the tie with an hour gone, with the night getting even worse for United late on when Pogba was shown a second yellow card to rule him out of the return leg in Paris. The loss is Ole Gunnar Solskjaer’s first since taking charge at United and leaves them with a mountain to climb to reach the last eight of the Champions League for the first time in five years. The first half was a tense affair, with more yellow cards than goalscoring opportunities, with the only real talking point being whether Ashley Young deserved a second yellow card for helping former United forward Angel Di Maria on his way into the metal railings at the side of the pitch. Without the injured Neymar and Edinson Cavani, the PSG goalscoring burden fell on young Mbappe and, having been a mere bystander in the early stages, he had the best chance of the first half, but fired wide on the slide, with only David de Gea to beat. After the break, though, there was only really one team in it, with Di Maria silencing the boos, whipping a corner in for Kimpembe to volley home the opener in the 53rd minute, before laying a perfect pass across for Mbappe to stroke home his 23rd goal of the season seven minutes later. United lost Jesse Lingard and Anthony Martial through injury in the first half, and never really offered anything in response in the second period, with replacements Juan Mata and Alexis Sanchez unable to inspire the hosts, with Pogba’s dismissal, having earned a second yellow card for a late lunge on Dani Alves, competing a miserable evening for Solskjaer and his side. The return leg takes place on March 6, with United really up against it, especially without the suspended Pogba, while PSG, finally, after plentiful knockout-round failings, are perhaps showing they have the mettle to go all the way this time round. A step too far for this United incumbent. The strides United have made under Solskjaer have been more than impressive, but this run of fixtures, with PSG twice, Chelsea, Liverpool, Arsenal and Manchester City to come could not have got off to a worse start. The naysayers have pointed to the meek calibre of some of the opponents Solskjaer’s United have beaten in their fine run since the Norwegian took charge, and those doubters will be buoyed by events at Old Trafford against the French champions. United were listless, and never looked like scoring, even with Martial and Lingard still on, with Solskjaer’s changes having little effect. Should Romelu Lukaku have been introduced earlier? Did United lack a gameplan against an experienced, well drilled PSG? Solskjaer’s first real failure certainly poses plenty of questions. Angel Di Maria. Honourable mention to Marco Verratti, who was excellent in the heart of the PSG midfield, but with boos ringing around the ground on his every touch, for Di Maria to register two assists to swing the tie in PSG’s favour, the former United man just edges it. He had bottles thrown at him from the crowd, was thrown into the metal railings in the first half, but he got up, and came again. He will be delighted with his night’s work. Manchester United: De Gea 6, Young 4, Bailly 5, Lindelof 6, Shaw 5, Pogba 3, Matic 7, Herrera 6, Lingard 6, Rashford 5, Martial 5. Subs: Sanchez 3, Mata 4, Lukaku N/A. PSG: Buffon 7, Kehrer 6, Thiago Silva 8, Kimpembe 8, Bernat 7, Marquinhos 7, Verratti 9, Alves 7, Draxler 7, Di Maria 9, Mbappe 8… Subs: Paredes 6, Dagba 6. 28’ - CHAAAAANCE! Draxler pokes the ball through for Mbappe, who has been a spectator so far, but he cannot guide the ball on target with just De Gea to beat on the slide. VAR would have been called into action there, as it was borderline offside! 53’ - GOOOOOAAAALLLLLL!!!! Manchester United 0-1 Paris Saint-Germain. Away goal for PSG with Kimpembe firing into the roof of the net at the far post. Poor defending from United, who left Kimpembe free at the back post, with the defender controlling the volley into the net, unmarked. United have been poor in this second half, with PSG very much on top. 56’ - WIDE! Dani Alves comes within a whisker of a second for PSG, but his volley from the edge of the box is deflected just wide off Pogba. That could have gone anywhere. 60’ - GOOOOOAAAAALLLLLL!!!! Manchester United 0-2 Paris Saint-Germain. Tie over? Di Maria feeds Mbappe to make to two for PSG. Brilliant from Di Maria, who most certainly will be enjoying this. Two assists for him. The ball across for Mbappe was inch-perfect, and the finish as exquisite as you'd expect from the super-talented Frenchman. United caught cold by a goal of real quality. 63’ SAVE! United are struggling to keep tabs on Mbappe here, who races clear, tries to dink the ball over De Gea, but the United stopper stands tall to make the save. 65’ - SAVE! United are all over the place here, with Young caught out, allowing Bernat to steal in from the angle, with De Gea forced into a fine save to deny the full back. 89’ - RED CARD! It is Pogba who has been sent off, who earned a second yellow for a late lunge on Dani Alves. PSG’s Kylian Mbappe became the third player to score in his first three away Champions League appearances in England, after Luis Enrique and Edin Dzeko.